For a while now, I've wanted a crash pad. A crash pad is just a big soft something to crash into or jump upon. And crashing into things (safely) and jumping on things (safely) is a great way to get vestibular and proprioceptive input. Which I'm concerned about because of my sensory son. It's also a great way to burn off pent-up energy indoors. Which I'm concerned about because of my wild-child, climb everything and jump off son. Now, of course, these things are available for purchase, but they are mighty expensive...so I decided to make one. The problem was, I didn't know what to stuff it with. I mean, there are plenty of soft materials out there with which to stuff a crash pad, but if I were to purchase enough of any of those soft materials to make a crash pad, that would definitely put this project well out of my price range. So I stewed on it a while, and was struck with a genius idea. We've got all these extra pillows and blankets around. And we kind of have to keep them around for guests (even though half of our guests usually bring their own pillows), but they're a storage issue, you know? They're bulky. Take up a lot of space. Can you see where I'm going with this? Oh yes, I'm gonna make me a crash pad and solve my storage issue, all in one fell swoop. I used a queen sized flat sheet* whose fitted mate had worn out long ago, and laid it flat on the floor, right side up. 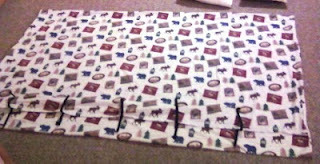 Then I folded each end (top and bottom of the sheet) toward the middle, overlapping the edges about 5 inches. I sewed along the two open sides, and turned it right side out, which resulted in an envelope. Or a very large pillow slipcover. Next I sewed ties (I used double fold bias tape, because that's what I had on hand) to the top and bottom of the sheet, at the opening where they met. I used 5 sets across the opening. 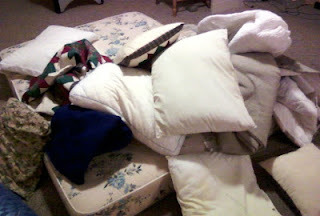 I stuffed in all those extra pillows and blankets, a couple of mattress pads, and even 2 sleeping bag liners that Hubby and I made but haven't used in years, but that he doesn't want to get rid of. Bam. Crash pad made; storage issue solved. When we have guests, we can just remove the appropriate number of pillows from the crash pad. It took me less than half an hour, and zero dollars to make. If you don't sew, you can also just stuff pillows and blankets into a duvet cover. Or ask someone to make one for you--they won't mind. And then? And then we jumped. And jumped again. And again and again and again and then we came back and jumped again the next day. This post is the first in my Sensory Playroom series--I'm putting together a sensory room for my boys on the cheap (read: homemade) and decided to share with you all :) To see all the sensory playroom posts, click here. I'm so glad I found your site!! I'm making plans right now to make a sensory room for my 6 year old son...and his 2 year old sister :) I can not wait to make this crash pad. I have a white duvet cover that I'm going to dye. Thanks for the wonderful ideas! Thank you for this! You just saved me money and saved more foam from ending up in a land fill someday. 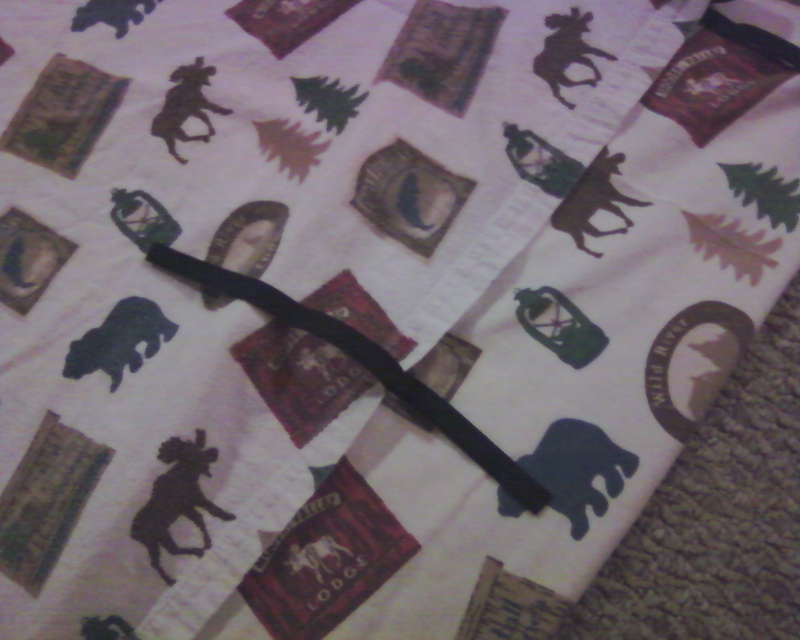 I just made a crash pad using an old futon cover that zips closed. Works perfectly! Just discovered I don't have four wild children (ages 2 to 9), I have four 24/7 SPD sensory seekers we're transforming our 'living room' into a sensory room with a few old couches my husband picked up online this crash pad along with lots of things to climb - need to go order a few indoor swings off Amazon and a few other things we're set!